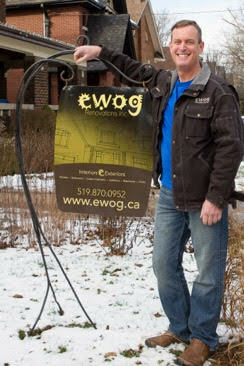 The People | EWOG Renovations Inc.
ewog Renovations Inc. was formed in April 2002 in London Ontario, but is part of a family tradition that started in 1920. Company president Paul Bremner is the grandson of John Bremner, a prominent London builder who ran John Bremner Contracting. John built many of the magnificent homes along Commissioners Road in the picturesque Southwestern Ontario city. To give you a sense of Paul’s reputation we gathered his testimonials and referrals that he has received over the course of his companys’ history. One thing stands out right away — Paul is a perfectionist, and has the ability in people and skill to make it happen. He is dedicated to imaginative and breathtaking design but not at the expense of the customers’ vision. His background in IT, being a bit of a geek himself, sets the stage for successful problem solving — a great asset as a contractor, but even more so to deal with what is placed before him in his work. He takes a step back, looks at the options and gives his clients the best, most up-to date information possible. He takes the time to answer questions and makes sure you have the facts to make the best decisions. He is a straight shooter. His work is beautiful – look at some of his portfolio as a few examples. Also, Paul and his son build beautiful handcrafted guitars in their spare time. His creativity and approach is clearly shown. If you have ever tried to build an instrument you would know this is no simple feat. It takes a dedication and a love of what you do. Paul loves to create. There is a joy in him as he works creating an inviting space for his clients or working in his workshop. In fact, he has been known to sing along with the radio while working. No worries, I don’t think he moonlights as a lounge singer and you won’t find him on iTunes – yet. Designing and building great spaces is what he really loves most and that suits him just fine. Now you know why you should ewog Renovations working with you on your next project.